The coaches of the qualified teams pose for a group photo at the end of the 2018 soccer World Cup draw in the Kremlin in Moscow, Dec. 1, 2017. A World Cup shrouded in corruption controversies and struggling to attract sponsors could have the dreariest of starts on the field: a meeting of the lowest-ranked teams in the 32-team field. Host Russia and Saudi Arabia play June 14 at Moscow in an opener lacking global appeal, but things pick up the next day when 2010 champion Spain and defending European champion Portugal meet in Sochi. The Iberian neighbors were drawn into Group B at a Kremlin ceremony Friday. Morocco coach Herve Renard hoped to avoid the "two ogres" but will face them along with Iran. "It's a complicated group," Spain coach Julen Lopetegui said. "It will be tough. Portugal is a great team. It is the defending European champion and has a squad filled with top players." None more so than Cristiano Ronaldo, who recently joined Argentina's Lionel Messi as the only five-time winners of FIFA's player of the year award. Messi's quest for his first World Cup title begins the following day when Argentina takes on Iceland — at 334,000 the least-populous country to qualify for the World Cup. Iceland coach Heimir Hallgrimsson already knows what he must tell his team: "Watch out for No. 10." The United States is missing from soccer's top event for the first time since 1986 and four-time champion Italy will be watching from afar for the first time since 1958. 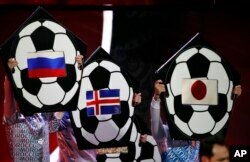 The flags of Russia, Iceland and Japan are held up on placards during the 2018 soccer World Cup draw in the Kremlin in Moscow, Dec. 1, 2017. Germany remains the favorite. Its depth was clear when an experimental squad won the Confederations Cup in Russia in July. Germany opens against Mexico in its quest to become the first country to win back-to-back World Cup titles since Brazil in 1962. The Germans then face Sweden and South Korea in Group F.
"We got opponents that are not unknown to us," Germany captain Manuel Neuer said. "That's what I like best, when we know what to expect." Germany is hoping to be based in Sochi along with Brazil. The only five-time world champion does not intend to move its training camp despite a schedule that has none of its games in the Black Sea resort. The Selecao, beaten 7-1 at home by Germany in the 2014 semifinals, were drawn in Group E with Switzerland, Costa Rica and Serbia. "Despite the distances, there are quick ways to get there," Brazil coach Tite said. England, eliminated in the group stage three years ago, was drawn into Group G along with newcomer Panama, Tunisia and Belgium. Gareth Southgate's first World Cup game as a coach will be a repeat of his first as a player — Southgate made his World Cup debut in England's 2-0 win over Tunisia in 1998. "We've been good at writing off teams and then getting beaten by them," Southgate said. Roberto Martinez also will be making his World Cup debut. But the Belgium coach knows England well after spending two decades there as a coach and player. "It is going to be one of those games with no secrets," said Martinez, a former Everton manager. "We have 25 players in the British game. That brings that understanding. That brings that competitive level." "It could have been worse," France coach Didier Deschamps said. The only group without a former World Cup champion is H — Poland, Senegal, Colombia and Japan. The Russians have been placed with the winners of the first World Cup — Uruguay — in Group A along with Egypt and Uruguay. At No. 65, Russia is the lowest-ranked team at the tournament, with Saudi Arabia only two places higher. "I've never seen them," Russia coach Stanislav Cherchesov said. 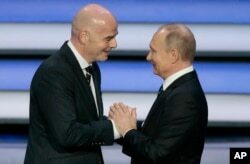 FIFA president Gianni Infantino, left, and Russian President Vladimir Putin shakes hands at the 2018 soccer World Cup draw in the Kremlin in Moscow, Dec. 1, 2017. The ceremony was opened by Russian President Vladimir Putin, one day short of the seventh anniversary of the FIFA executive committee vote that awarded the 2018 World Cup to Russia and the 2022 tournament to Qatar — the subject of bribe allegations against soccer executives brought up nearly daily in New York during a corruption trial against top soccer officials. Putin urged fans to visit and enjoy his "big and multifaceted" country, a rallying cry that comes amid concerns about racism and hooliganism. "We will do everything to make it a major sporting festival," Putin said, anticipating a World Cup of "friendship and fair play, values that do not change with time." The Olympic doping scandal surrounding Russia hung over the final countdown to the draw. Russian Deputy Prime Minister Vitaly Mutko, head of the local World Cup organizing committee, defended himself against accusations he helped orchestrate state-sponsored doping at the 2014 Sochi Olympics. "Nowadays everyone is trying to make some kind of axis of evil out of us, just because we're a great sporting power," Mutko said. The International Olympic Committee executive board will decide Tuesday whether to ban Russia from the upcoming Pyeongchang Olympics.